Clean up both dry and wet messes with ease. This broom and dust pan tackles both kinds of dirty jobs—even if one mess is both at the same time. Switch between bristles and a squeegee with just a quick rotation of the broom head. And the extra-deep dustpan cleans up all the mess in one go. Dimensions: 15" x 10.25" x 6.5"
As the proud owner of a dozen cats, this handy little tool is a must have! I use it everyday, to keep the cat litter swept up and keep kibbles from ending up everywhere. It really came in handy when my drains backed up and I had a huge slimy mess all over my basement floor. It was a breeze to just squeegee up the mess instead of using a ton of towels. This is such a handy tool and very well made, I’m definitely impressed. I loved the personal hand written note that came with it from Scott, it was touching and made me happy to have chosen their small company who cares about their customers. I will be back for a few more of these to give as gifts as you simply can’t beat the quality of this gem. This is one handy little broom/dust pan. It’s right there for the job when you need it. I've had the Wallybroom for a few weeks now and it is very handy. I recently ( in the past year) moved into a tiny house and gave this purchase actually quite a lot of thought. Part of downsizing my belongings was getting rid of what was broken/didn't work anymore, and then gradually replacing it with higher quality pieces. This set cleans up wet and dry messes equally well. The broom seems sturdier in hand than I thought it might be, given the swivel mechanism. And the dust pan is definitely built to withstand some mistreatment, as I accidentally knocked it down a half-flight of stairs without cracking it (from experience I know that if it had been the cheaper kind I usually get, it wouldn't have survived the fall). 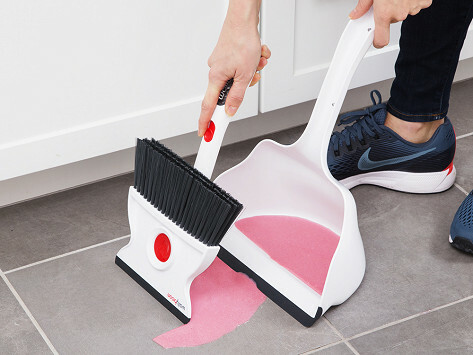 From dirt to spilled milk (literally), Wallybroom is a one-stop cleaner-upper. It’s scaled down from a traditional broom size, which makes it easier to store in tight spaces. 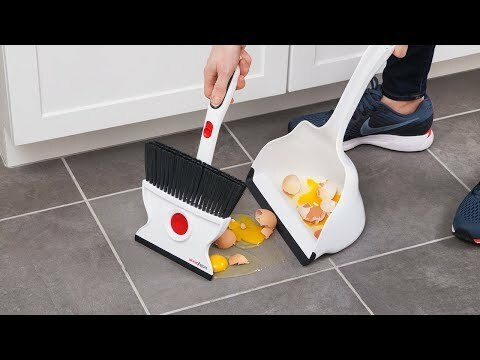 The oversized dustpan has a curved dam to better corral messes, and a rubber lip makes it easier to scoop messes up off the floor. And because it holds more than a usual dustpan can, you can clean up a pretty intense mess with just one trip to the trashcan.